Summer is coming and you want to look good. You are probably wondering how to build muscle quickly. “Quickly” is a relative term as the fastest possible muscle growth can be achieved through steroids which are not only illegal, but unhealthy and expensive as well. If you are a beginner, a proper workout regime, supported by a good diet and lifestyle habits will help you dramatically improve your body only within a few months. You should realize that building muscle is only part of the battle; you still have to achieve a relatively low body fat level for your muscle to show. The key to looking shredded is not just being “big”, it’s about having muscle definition and low fat percentage. Metabolism rate seems to decrease with age and it is normal to have a small beer belly if you are over 30. All of this can be fixed with proper amount of exercise and the right diet. Let’s start out with the workout regime first. For muscle growth, you should focus on relatively heavy free weight exercises. For each muscle group, it is optimal to do 3-5 exercises with 3-4 sets each. Each set should consist of 6 to 8 repetitions. Make sure that when you are performing the exercises you are executing them properly and with a full range of motion. Don’t forget about warming up your limbs before the exercises to avoid injury and strain. If you are a newbie at a gym it would be wise to ask for assistance from one of the trainers. They can also help you come up with a workout program that would be appropriate for your body. For each exercise start with lighter weights and work your way up to the heavier ones where you can feel greater resistance. As for the exercises themselves – it is good to stick to free weight exercises such as dead lifts, squats and dumbbell or barbell bench press. However, be careful with dead lifts and squats. Use lighter weights to learn the proper execution and advance slowly. These exercises can pose a high risk to backbone and neck if executed wrongly. Apart from a good workout regime, you should stick to a balanced diet as well. Professional bodybuilders eat up to 8 meals per day. Professional bodybuilders also look overly big and bloated when they aren’t dieting for the stage. It is really hard to maintain such a physique, so instead we should focus on getting an aesthetic body, which is pleasing to the eye and will only provoke positive reactions from the people. For this goal you will still have to have a proper diet in place. Ideally, you should have 5-6 smaller meals throughout the day instead of 3 big ones. Depending on your current weight and body fat levels you might need to consume more or less calories, probably more. Your diet should be balanced and healthy. Avoid fat foods and go for lean meat instead. Oatmeal is a good choice, along with some vegetables, fruits and fish. Milk and cheese products also work wonders. I would recommend eating a bowl of cottage cheese every day about 30 minutes before bed. Not only will it feed the muscles, but improve brain functioning as well. Lastly, lifestyle plays a very important role in building muscle. If you do not let your body rest and do not sleep for 8-9 hours each day, your muscle will not develop as efficiently as it should. Drugs, alcohol, stress and smoking can all negatively affect your journey for the perfect body. You can treat yourself once in a while, but overall you should follow a healthy lifestyle. Stress can also affect your body and muscle growth negatively. The most important aspect of your training is persistence. If you are skipping weeks of workout it will prove difficult to achieve the desired result. After 3 months of regular training you can take a break and let your body rest for a week. Don’t become obsessed with training but in the mean time – don’t neglect it. It is easier to maintain a body and muscle tonus than getting it in the first place, but it still requires discipline – you have to control your eating and lifestyle habits. You might need to incorporate some cardio training in your workouts if you feel that you are overweight and want to transform that fat into muscle. Start with a 5 to 10 minute warm up run on the treadmill, the stepping machine or a stationary bicycle before the workout session. The warm up session should be moderate and not too intense; you have to save energy for the main part of the workout – heavy weights. After finishing your workout go for a longer run on the treadmill or another aerobic exercise machine of your choice. Start with 10 minutes and work your way up to 30. Give it all you have but do not go overboard. This combination of aerobic cardio workout and weight lifting might be intense, but it will yield results and results are what we are after. Another type of cardio training that I recommend for everyone at any age is swimming. Swimming is great because it doesn’t pose any health risks; it exercises all the muscles on your body. 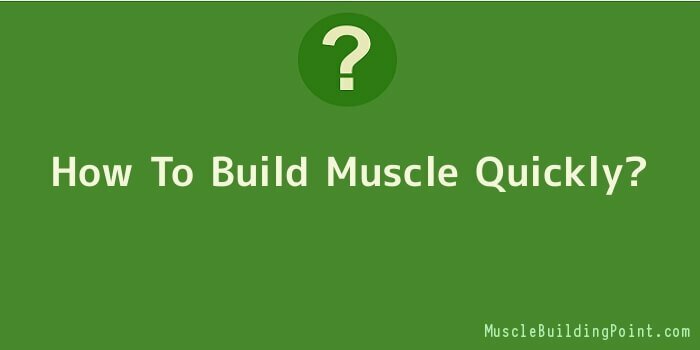 This is the basic information when it comes to how to build muscle quickly. There is still a lot to learn, for example, how to execute your workouts properly, and what exact foods to eat and in what proportions, how to perform the warm up and stretching exercises, how to build muscle quickly & maintaining it, etc…you can find answers to these questions online.